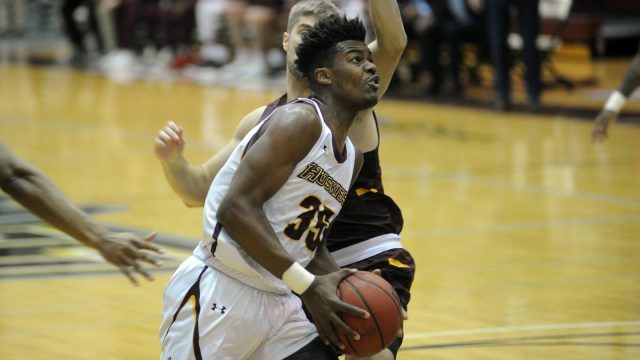 The Bloomsburg University men’s basketball team dropped its fourth consecutive game on Wednesday night as it fell at Slippery Rock University, 90-72, at the Morrow Field House. The Huskies dropped to 3-6 overall and 1-4 in the Pennsylvania State Athletic Conference (PSAC) Eastern Division while The Rock improved to 6-5 overall and 3-1 in the PSAC West. The Rock, however, scored the first eight points of the second half to extend the lead to 49-36 with 17:43 left in regulation. The lead was in double figures for much of the half except when Bloomsburg trimmed the advantage to nine, 60-51, with 10:27 left after Elmore hit a layup. But, Slippery Rock scored six of the game’s next eight points to build the lead back up to 13 with 8:44 remaining. Till led The Rock with 29 points and 13 rebounds while Armstrong and John Warren II added 13 points apiece.